In stark contrast to previous years, police officers on Wednesday cleared the way for a protest march to mark four years since the abduction of Maldives Independent journalist Ahmed Rilwan. Led by Rilwan’s parents and family, about 250 people marched half the length of the capital’s main thoroughfare as a small group of police officers diverted traffic. The march ended with a gathering at Malé’s western artificial beach where former colleagues, members of civil society and Rilwan’s father delivered speeches. Calling for an independent inquiry, protesters chanted, “It’s been four years, where is Rilwan?” “The knife went missing, Rilwan is still missing,” and “Investigate President [Abdulla] Yameen”. They held up placards with photos of state officials accused of complicity, including the president, his jailed former deputy, and the prosecutor general. It was the first protest march in the capital without police obstruction since late 2015. At the third anniversary last year, chants of “Where is Rilwan?” were met with pepper spray as riot police snatched banners and placards and arrested nine people. The constitution guarantees the right to protest without prior permission, but the 2013 Freedom of Assembly Act was revised to restrict protests and gatherings in the capital to areas designated by the home ministry, which later picked the carnival area in Malé’s eastern waterfront. The amended law requires written permission from the police to gather in other areas. But Wednesday’s march was allowed to proceed despite organisers failing to give any notice. “Police were very good to us today. Why can’t they be like this always? We aren’t trying to shatter the laws, we are practicing the freedom of assembly given to us by the constitution,” said Ahmed Mohamed ‘Forme,’ one of the organisers. But police officers asked for the gathering to be concluded before 6 pm. The march took place amid heightened outrage after the acquittal of two suspects charged over the abduction and the president declaring that Rilwan was dead. He has since apologised and expressed hope that Rilwan would be found alive. 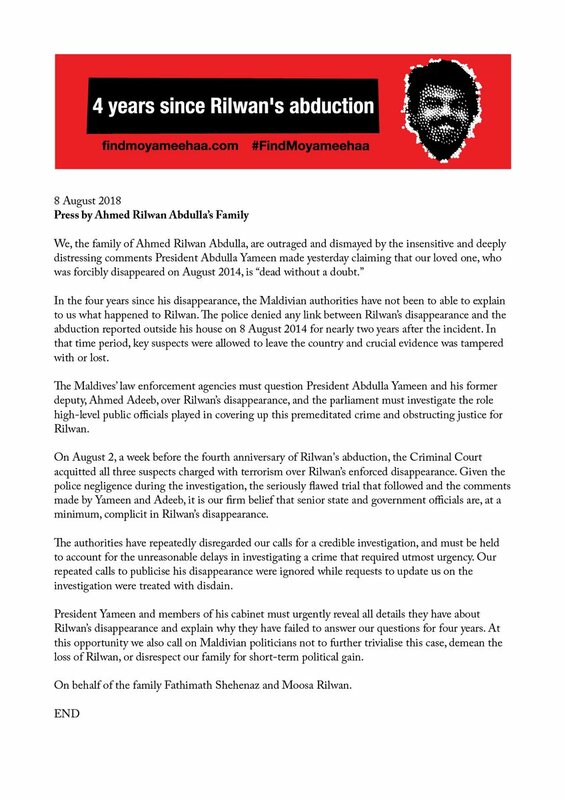 Last week’s not guilty verdict showed “at minimum state complicity and, at worst, active involvement in Rilwan’s abduction and disappearance,” Rilwan’s family said, announcing their intention to sue the police. Police knew Rilwan was followed on the night of his disappearance but waited nearly two years before confirming the abduction. By then, a suspect who was arrested with evidence of hostile surveillance had been allowed to leave the country. Mohamed Suaid was interrogated on October 1, 2014 and accused of lying when he denied following Rilwan, the Maldives Independent has learned.